It’s already Friday again and I cannot tell you how thrilled I am about today’s Fabulous Cake. My favorite part about writing Half Baked is not the gorgeous parties or the decadent dessert tables we feature. It’s the cakes. Cake is how this blog started and it’s at the heart of it all – my heart. Sometimes we feature cakes created by designers who have already made their mark. They’ve been featured in magazines, have thriving businesses and create absolutely stellar cakes. Everyone loves them! Sometimes I have the opportunity to feature new talent, designers just getting started and looking to break through. Honestly, I just love introducing new talent! And that’s exactly what we have in store for you today! 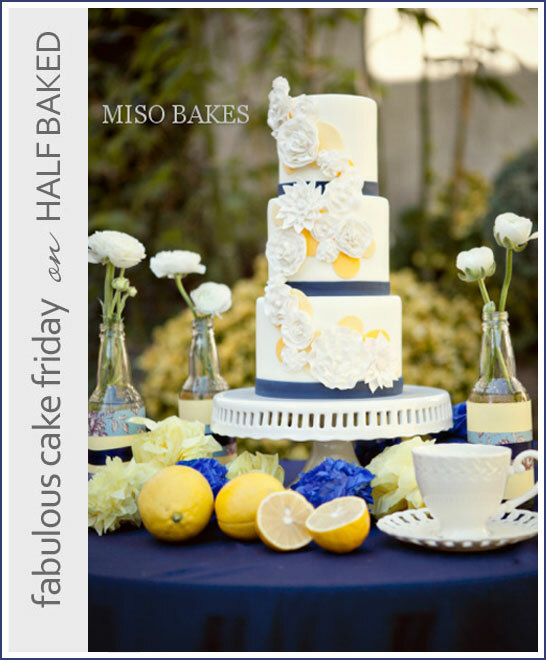 Today’s Fabulous Cake is from a designer who is still building her portfolio. But you definitely can’t tell that by looking at this cake. It is magazine worthy and will make you swoon! Bask in this gorgeous ode to Summer…. 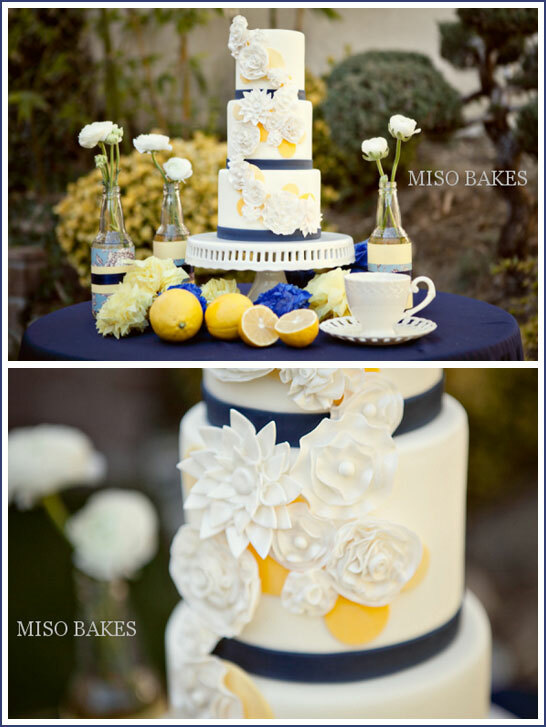 a lemonade yellow, navy blue and white cake created by the talented Stella of Miso Bakes. There are some things you can learn in a cake class. How to roll fondant or stack tiers. What you can’t be taught is passion and style. That has to come from within. It is obvious to me that Stella naturally has both a passion for cake design and keen eye for style. I know we will see great things from her in the future! A very special thank you to Stella for sharing her lovely Summer Lemonade Cake with us. 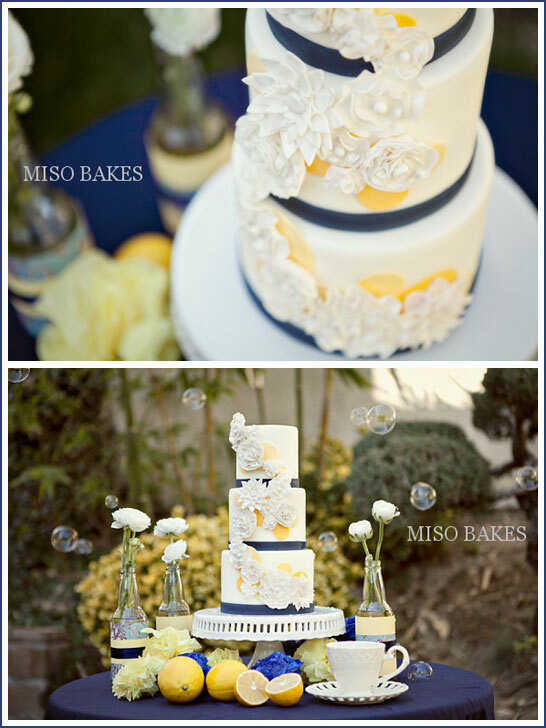 You can see more of her amazing cake creations on her blog, Miso Bakes. This is just gorgeous! Love the colors and the warmth! So charming! My favorite pic is the one with the bubbles. Love the color choices and style! Such a stunning cake! I can feel the summer love! Ah, cake and lemonade. Now that is a combo I could enjoy. Great design!! Just wondering where the pretty cake stand can be purchased?